During my PhD I created many ‘shrouds’ using an installation set up on a farm in the Monaro where Tony and his partner the sculptor Steven Holland live. The crested pigeon was found deceased on a road in Canberra and placed on a sprung bed-base to decompose. The eucalypt under which the canvas lay leached its rich brown bark juice on the right hand side while the mesh protecting the body from predators left a rusty imprint. Originally exhibited without further work undertaken as Alone (Spring Pigeon) 2011 in my graduate show, I was suddenly compelled to take the work to Hill End with me in 2016. It was there I added my most common motif, the nest using delek the sacred white ochre from Madjarlngarlkum in Western Arnhem Land. The nest is a cosy home offered to the bird and myself when away from home. I then painted in the post-decomposed body of the pigeon using bitumen and a touch of oils that speak to the bark stain. I lined the bird beaks up like a reflection, a conversation between two forms of representation; one created by the disintegrating subject another the painted signifier. 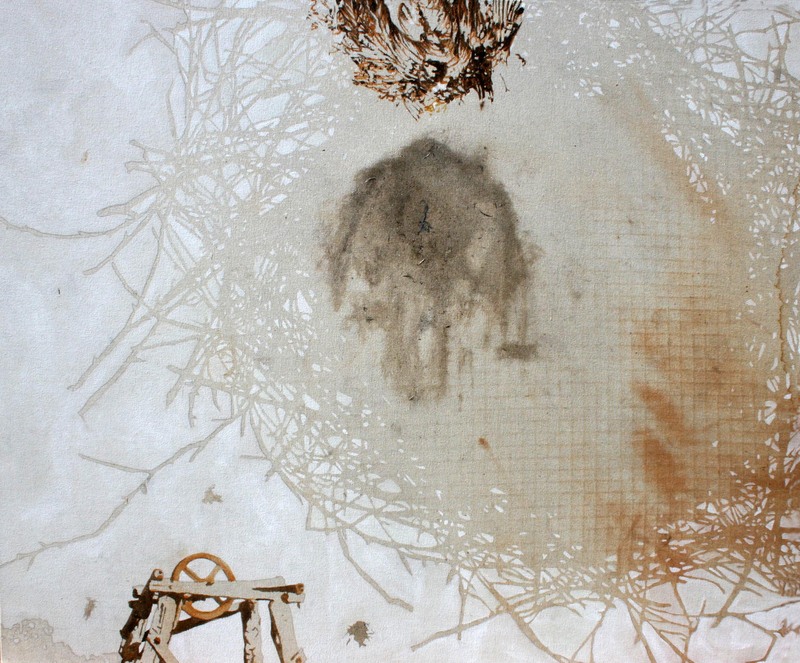 I then located the work in Hill End by painting in an iconic structure found in the town using a very minimal technique in which the main body of the figure consists of the raw canvas ground sized with rabbit skin glue which sparkles under lights and seals the bodily fluids and debris to the surface.